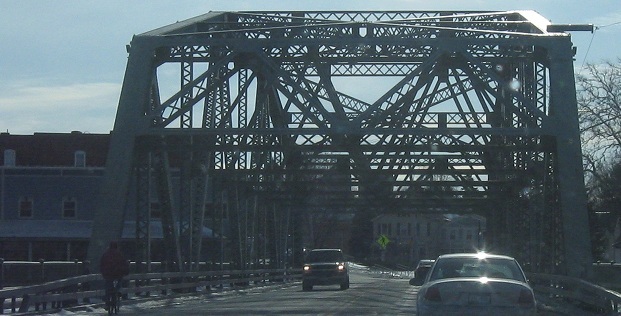 NB in Baldwinsville, in the middle of crossing the Seneca River on Mill Island. 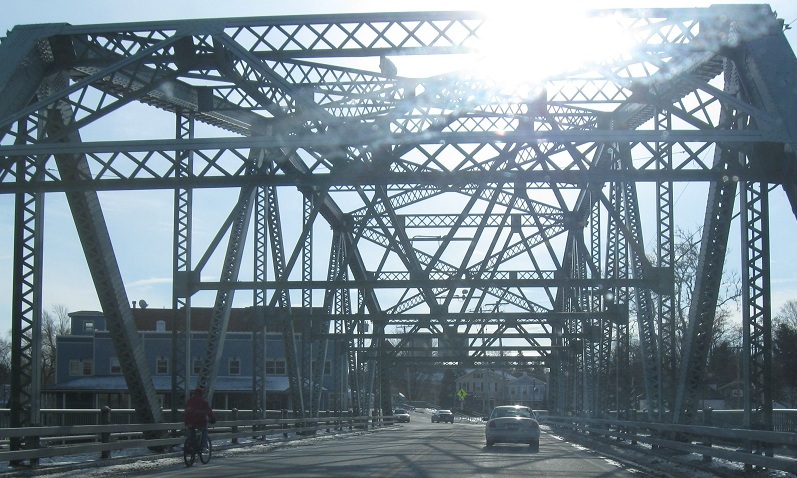 SB across that bridge, then across the smaller bridge on the south side of Mill Island. Courtesy Doug Kerr, in Fulton. 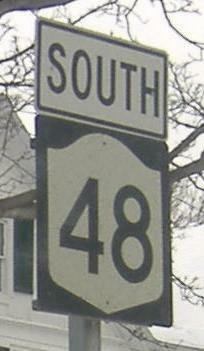 NY 176 now ends to the south, but used to extend up 48 to NY 3, and before that even farther toward Scriba along Whitaker Rd. on the east side of the Oswego River. You can see the old font in the 7 and 6. Another old Fulton sign. 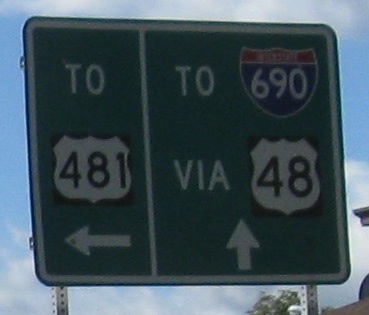 NY 48 runs up the west side of the river, and the newer NY 481 (the extension of I-481) runs up the east side in a happy coincidence. Another Doug Kerr photo; the shield and arrow are also old, but the state park sign is older. 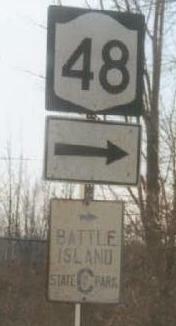 There was still one of these southbound (no arrow, though) leaving Oswego in 2008, but I wasn't able to get a photo. What's the big C for? Commission? The fact I even have to ask is why the sign pattern was discontinued. SB in Oswego from the start of the route. It's the only US error I found at that time, but I believe there are others. Here's another error, albeit on a green sign, on W. 1st St. SB. 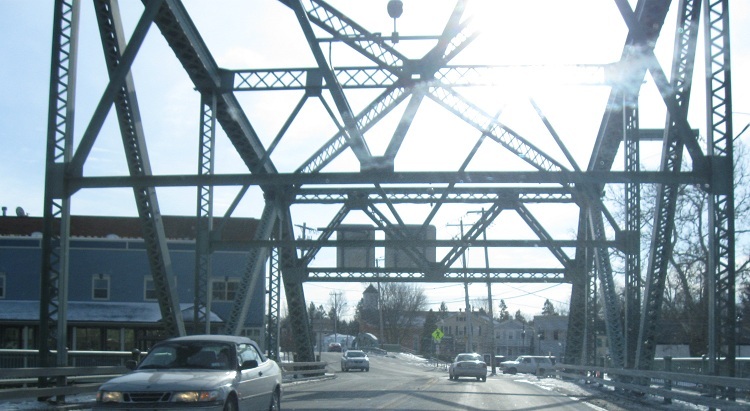 NY 48 turns from Utica St., which crosses the Oswego River to US 481. 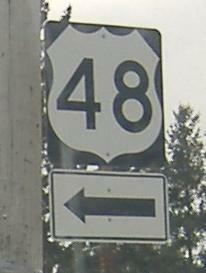 There is no US 481, but at least Utica St. signage is consistent - see the link below. 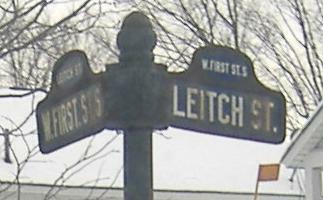 A quick NB sign progression in the same town. 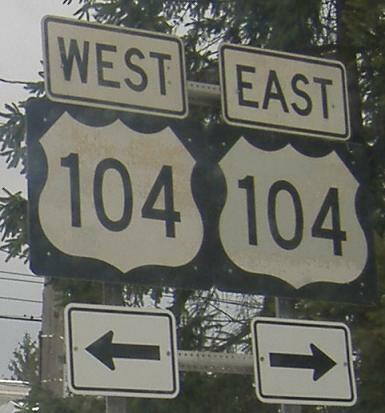 These aren't actually US errors even though this is NY 104, because when the signs were made this was US 104. 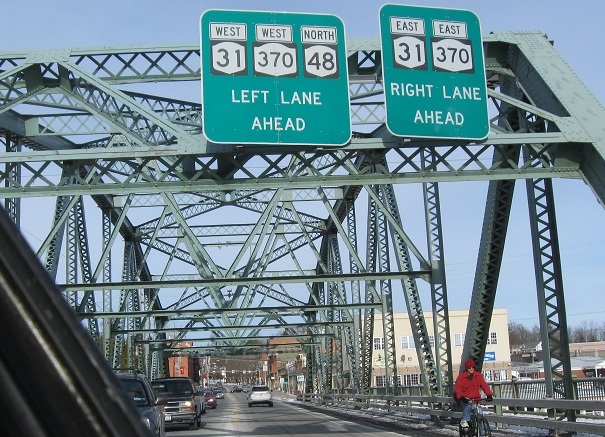 NY just made it easy by keeping the number when the one-state route was decommissioned, which means these shields are older than 1972. 104 never came close to US 4 - it should really have been a spur of US 11.